Amongst the trees at Horseshoe Bend Marina are a collection of cozy, well-decorated canvas tents. In the morning you'll walk out onto the porch and breathe in the fresh air while you soak up the views of the river. By day we will learn and grow and stretch ourselves both physically and mentally. By night we will celebrate, eat, and howl at the moon. For pricing options and tickets click the link below "get your tickets here!". Nestled amongst the trees are five beautifully decorated and fully furnished canvas tents. There is room for (8) standard tickets—four people in two beds per tent or (4) VIP tickets—two people in one bed per tent. 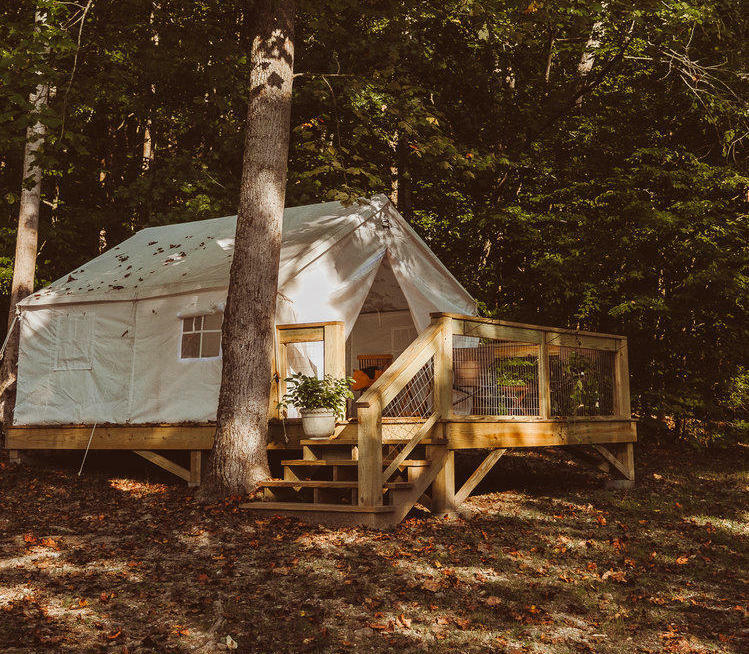 Each tent comes with a full bed with memory foam mattress and chairs that you can slide out onto your porch in the morning while you sip your coffee or tea. (To reserve a spot with a friend send us an email with your rooming requirements). To book your spot scroll to the top of the page and select "let's do this!". For women that need a break from the stresses and expectations of life. For women looking to deepen their practice and those that have never practiced alike. For women looking to grow new friendships and celebrate sisterhood. For women seeking a little bit more everyday magic. We'll flow, stretch, rest, and strengthen while we tap into something bigger than ourselves and deepen our practice. Learn how to make delicious meals that are as practical as they are impressive. From knife skills to sauces, you'll leave with information you can use. Retreats are a powerful way to let your guard down in a safe and loving environment. You'll make friendships to last a lifetime. Arrive any time between 4:00 and 6:00 to check in and get settled into your tent. We'll take some time to get quiet and take inventory of our inner landscape. We'll set goals and intentions for our time together and run through a couple exercises to help us do so. We'll sit around the long table eating and getting to know each other. A time to relax, unwind, and forge new friendships. As we wind down and prepare for a good night's sleep we'll sip on hot tea or a glass of wine before we retire to our tents with journaling prompts and spend some time in self reflection. This is your retreat and your time so breakfast will be open for you to enjoy at your leisure from 6-9 depending on which activities you want to participate in and which you would rather spend alone. A 60 min vinyasa class designed to get your blood flowing and your heart open. As with all classes attendance is optional. During this hour you will have time for self reflection and guided journaling prompts. Its a time to curl up with a cup of coffee and good book, journal in your tent, or have meaningful conversation with your fellow retreaters. The benefits of herbal bitters on digestion have long been understood. In this class we will learn how to responsibly craft our own bitters and how to use them for our overall health. You'll get to take home your own herbal brew for later straining and bottling. Make friends. Have ideas. Take naps. Eat snacks. This is your free time! For those that want to stimulate the digestive system and get the blood flowing after lunch we’ll take a hike out to the waterfall. We'll spend some time in meditation and then the rest of the time is yours. It’s a perfect place to rest and journal or just take a nap in the sun once you get there. Slow flow restorative helps us wind down from the day and stretch the body before dinner. Pre-dinner cocktails kick off this night of bonding and celebration. Long table, string lights, wrapped in blankets, giant bowls of hummus, delicious food, more drinks. Join us around the bonfire as we listen to live music, tell stories, and burn away what no longer serves us. This is your retreat and your time so breakfast will be open for you to enjoy at your leisure from 6-8. Another beautiful, bright vinyasa full of sun salutations to greet the day and get you started off right. Before we leave we'll take some time to gather around and share from our journals and from our hearts anything we learned and what we will take away from this retreat. It's a time to share and be vulnerable and see where it takes you. Take this last meal to celebrate our sisterhood and practice gratitude. Now it's our turn to express our gratitude and give some gifts! Time to pack up and head back home!